If someone hadn't happened to walk by, this sweet black and white cat would likely still be chained up all alone in the woods outside of Spring, Texas ... or worse. Janet Zimmerman, a volunteer with an animal rescue, was out looking for a lost dog last week when she heard a cat meowing nearby. "She tracked the sound down to some small trees and underbrush and was shocked by what she found," Copper's Cat Commune, a local cat-rescue group posted on Facebook. "There amidst some thorny branches or vines was a black and white cat ... CHAINED TO A TREE." 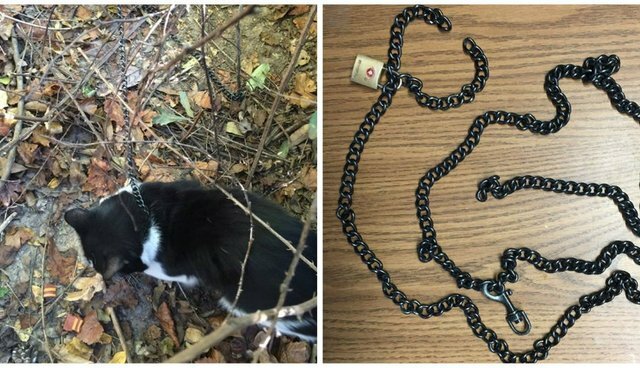 The 1-year-old cat was chained up, with a padlock around his neck. "It was no accident," Zimmermann told local outlet ABC13. "Someone did this to him. Maybe as dog or animal bait, maybe as a Halloween sacrifice. I was shocked - stunned." Zimmerman rescued him on the spot. The cat, whom rescuers have named Forest, was unharmed by the experience - both physically and emotionally. "He is super sweet and social," the cat rescue posted on its Facebook page. Forest is now staying at a local animal clinic while volunteers from Copper's Cat Commune work to find him the perfect forever family. In the meantime, he's snuggling with everyone he meets and enjoying all the love and attention. The rescue told The Dodo that they've already received several applications for his adoption, and a select few families are coming to meet him next weekend - which means that Forest is out of the woods and well on his way to a life as a beloved pet.